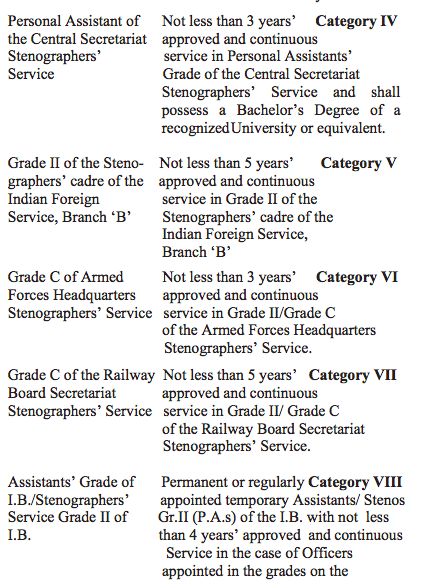 UPSC conducts a Combined Limited Departmental (CLD) Competitive Examination for additions in the Select Lists for the Section Officers’ Grade and Stenographers’ Grade B/Grade ‘1’ of the Services mentioned in the categories mentioned below. UPSC Calendar has declared that applications for SO/Steno will be begin on 12th September 2018 and the last date to apply is 5th October 2018. The exam is scheduled for 15th and 16th of December 2018. UPSC has notified that applications for SO/Steno exam will begin on the 12th of September and continue till the the 5th of October 2018. UPSC SO/Steno Exam 2018 will take place on the 15th of December 2018 and will be conducted over the course of 2 days. 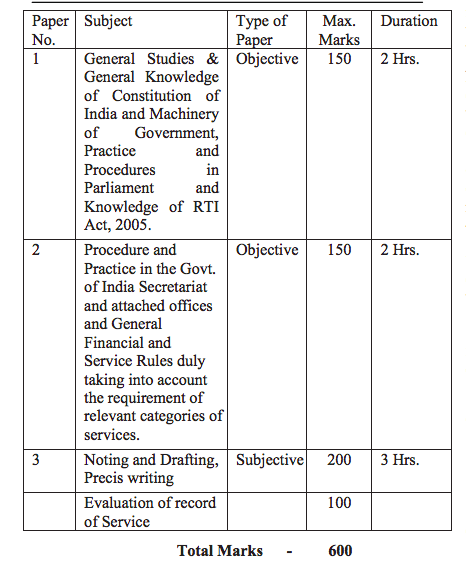 Permanent/regularly appointed temporary Officers of the Grade and Services mentioned in the first Column in the images below who satisfy the conditions regarding length of service and educational qualification etc. 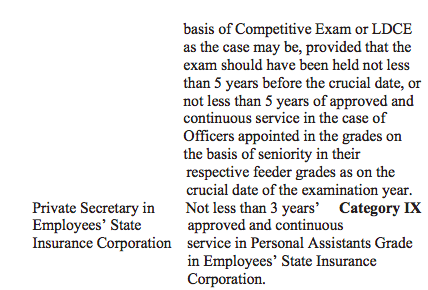 mentioned in the second column shall be eligible to appear at the examination for the category of service mentioned in column 3. Union Public Service Commission Section Officer exam is limited departmental competitive examination so as to recruit the eligible applicants for the various posts. UPSC holds a combined departmental competitive examination. The selection of the candidates is totally on the basis of their marks in the written examination. Those who will clear the written examination will appear for the personal interview round. Candidates would need to clear the personal interview round to be selected for the post of UPSC SO Stenographer. Applicants can register now and fill in all the necessary details. Applicants would then need to submit the application fee online for the examination. (a) Written examination carrying maximum of 500 marks in the subjects as shown in para 2 below. (b) A qualifying Shorthand test in Hindi or English at 100 w.p.m. All the candidates competing for Categories IV, V, VI, VII and IX will be required to take qualifying shorthand test at the time of the written examination. However, evaluation of record of service will be done of only those candidates who qualify both in the written examination as well as in the Shorthand Test. Candidates will be required to transcribe their shorthand notes on Computers (PCs) which will be provided at the Examination centre by the Commission. Negative marking of 0.33 marks will apply as penalty for every incorrectly answered question. (ii) who obtain such minimum qualifying marks in the written examination and the shorthand test as may be fixed by the Commission in their discretion (for Categories IV, V, VI, VII and IX). There shall be a minimum of 40% (forty percent) marks in the evaluation of record of service. Therefore, such candidates who obtain less than 40% (forty percent) marks in the evaluation of record of service will not be considered for ranking. The paper will include subjects of relevance in the present day. Questions will be set to test knowledge of the broad salient features of the Five Year Plans, Indian Economy and major Developmental Schemes as also intelligence awareness of current affairs both national and international. The organisation of the machinery of the Govt. of India, Designation and allocation of subjects between Ministries, Departments and Attached & Subordinate Offices and their relation inter se. This paper is intended to be intensive and detailed test in methods and procedure of work in the Government of India Secretariat and attached offices. Detailed knowledge of General Financial and Service Rules viz., Conduct Rules, Leave Rules, TA Rules etc. will be tested. Candidates are required to prepare notes and drafts on specific problems and précis from a passage. Admit Card for the SO/Steno exam will be made available on the UPSC official website – upsconline.nic.in. Admit cards will be released 1-2 weeks before the examination, ie, 15th and 16th December. Here, the notice for e-Admit Card will be available. Go through details mentioned on e-Admit Card carefully. Download and take a print out to carry to examination venue on exam date. A national level examination for UPSC SO Steno (GD-B/GD-I) LDCE to fill various central government vacancies was organized by Union Public Service Commission. All the candidates have fruitfully completed their UPSC Section Officer and Stenographer Written Examination on 14.12.2018. Now, all the examiners are eagerly waiting to download and check their UPSC SO Steno Result 2019. The official page has not released the UPSC SO Steno Result 2019. The Union Public Service Commission will release the score card for all entrants who took up the UPSC SO/Steno recruitment test about 15 days after the results are declared. To find out your score, use your roll number or registration number and DOB from the website of the Union Public Service Commission. You will be notified once the scorecard is out. You will find a link to the scorecard for UPSC SO/Steno 2019 written test when you visit the website. The Union Public Service Commission released UPSC Section Officer Answer Key 2019. You can download the UPSC Stenographer Answer Paper 2019 in a pdf format online. The UPSC SO Solved Paper 2019 is used by all the examiners to match with the correct question paper sets to evaluate their probable scores attained in the UPSC SO/Steno (GD-B/GD-I) LDCE Written Examination. Make sure you download the UPSC Steno Solution Keys 2019 for all question paper set/code wise. There are 4 sets- the Set A, Set B, Set C and Set D of UPSC SO/Steno Answer Keys 2019. It is an important tool for the candidates of this exam. UPSC conducts a Competitive Examination such that the Combined Limited Departmental (CLD) for the Select Lists for the Section Officers Grade and Stenographers Grade B or Grade ‘1’. The last date for application fee payment will be on the month of September 2019 and the exam for the year 2019 will be conducted during the month of December. The level of difficulty of the exam. The last year cutoff and lot more. The exact date for the exam will be announced later on the official website. So, the candidates are advised to visit the official website often to be updated with the exact dates for application, admit card and exam. The candidates must start preparing for the exam as early as possible to score maximum marks in the exam.